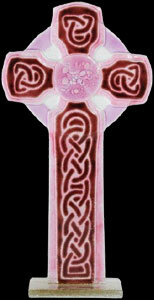 This beautiful Celtic Cross design is inspired by tradition. Many myths surround the origins and meanings of the designs. Perfect gift for lovers of Celtic artwork. Fused Glass Celtic Crosses make the perfect gift for friends and family on all occasions including Christmas, Birthdays, Mother's Day, Easter, Father's Day, Grandparents Day, Friendship Gifts, Handfastings, Remembrance Gifts, Thank You Gifts, Leaving Gifts and Anniversary Gifts!